Get set for more race action than you can handle as two wheelers, four wheelers and watersports get the Code Masters Quattro treatment. 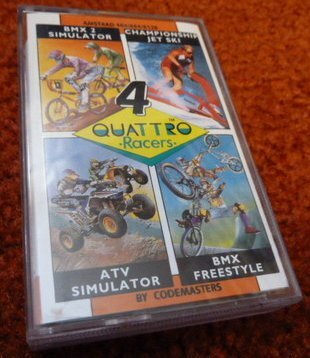 BMXing gets the full treatment with two exceptional and very different outings on this cassette. The first, BMX2, is an excellent simulator that'll have you racing against the clock and other competitors in a real rough and tumble outing in the mud. whilst BMX Freestyle takes you into the world of ramp jumps, wheelies, half-pipe tricks, jumps and competitions. Both games are a joy to play and with such features as slo-mo replay and the chance to customise your own bike, should not be missed. ATV Simulator takes you into the world of four wheeled dirt tracking, with sand and snow options for that extra variety in a series of races that'll have you on the edge of your seat at all times. Finishing off this excellent compilation, Championship Jet Ski will see you weaving around islands and bridges, leaping over jumps and making your way to the top of the ranks. Look out for the deadly weed and take it easy in the docks, or you could become parted from your trusty steed. All in all, four totally addictive race games, all completely individual and each featuring fast and furious action at its best. Get it now!